You and I live in a flat world and a global economy. As a result, we must regularly communicate with people of different languages and different cultures. This is especially true in the business world where self-directed teams and flattened organizational charts using the most sophisticated technologies have put diverse peoples together to solve diverse and often difficult problems, both on shore and off shore. And, for better or worse much of the world has chosen to communicate their business issues in English. I have seen this first-hand through my experiences as a teacher and a marketing professional. My business dealings have taken me around the world to places like Ankara, Sao Paulo, Brasilia, Pachuca, Delhi and Bogota, among other cities of the world. I have listened to Skype calls with associates in Mexico, Colombia, Panama, India, Kazakhstan and Qatar, and other countries. I have tried to help channel partners in these countries construct messages for developing business outside of America. I have hired translators to ease that process. In the classroom at Carnegie Mellon University, where I taught full time over the past 12 years, I instructed graduate students and corporate workers from all over the world. Besides having many students and classes in Pittsburgh, PA I have taught in London, Amsterdam, Chennai, Panama City, Tampico, and Astana, as well as in many cities in the USA, and have been streamed to classrooms as far away as Adelaide, Australia. I have taught professional writing and I have practiced it as a Chief Marketing Officer, Vice President of Marketing and Director of Corporate Communications for large and small companies, startups and old and prestigious organizations. I have learned what works and what doesn’t. And, I have been able to weed out the extraneous learning and simplify the body of knowledge about business writing to a few simple and practical steps. If teaching awards and great teacher ratings tell the story, then I have had a story of success. My students have routinely rated my teaching among the best. I don’t say that to brag. I say it to have these people confirm for you the secrets I am going to give you. Check me out on Facebook, Rate Your Professor, or the Carnegie Mellon teacher evaluation site. In any event, my “secrets” are not really secrets; they can be found in most good writing books. But I hereby save you the trouble of reading all those books. 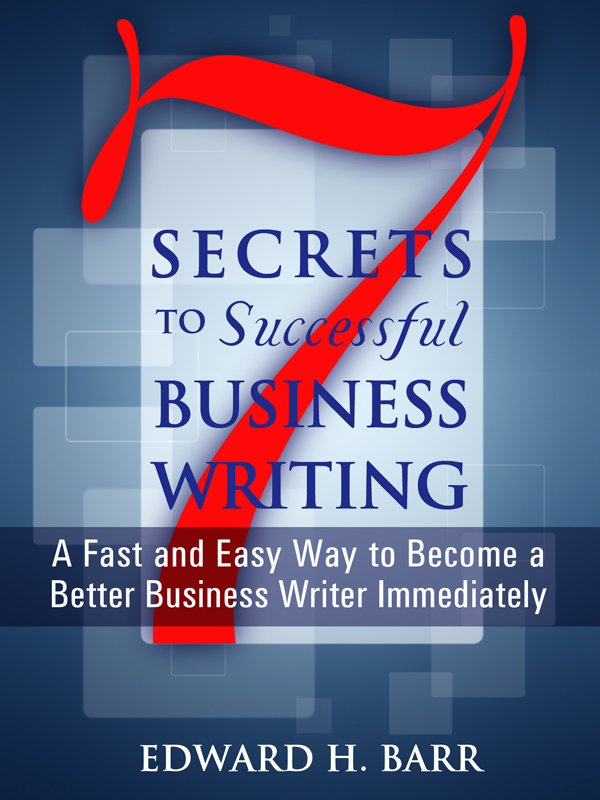 I have distilled all of the business writing knowledge I have gained from reading thousands of books and simplified the secrets into seven areas that can improve your writing overnight. I know that sounds like a television commercial but it’s true. If you follow these seven principles, you will write better over night. You can purchase the book online from Amazon http://www.amazon.com/Secrets-Successful-Business-Writing-ebook/dp/B00AZCJWTS.